Forest City Ratner is looking to glom onto an awful lot of housing subsidy with respect to its proposed Atlantic Yards megadevelopment. If you’re interested in knowing how much, this article attempts to close in on that figure. It’s in the neighborhood of about at least half a billion dollars, probably a fair amount more and the transaction has been set up so Forest City Ratner can blackmail the public for that money. • Finally, in landlord-tenant agreement, an official grant of arena naming rights; was there one in January 2007? • Agreement says Forest City Ratner must reinforce subway supports on its own dime, but does anyone know how much it would cost? • Affordable low-income units that are required by the tax code and would have to be in the project anyway. • Units above that specified income band that would be essentially what you could expect the market, unassisted by subsidy, to provide in the area. How much is this so-called “affordable” occupancy that is so favorable to the developer going to cost public agencies in terms of the housing subsidies Ratner intends to garner by providing it? For example, if the first tower built on the Arena Block contains 400 residential units under Scenario #1: where 50% of the units (200 units) would have rents set at market rate, 10% (40 units) at 150% AMI, 10% (40 units) at 120% AMI, 10% at 80% AMI (40 units), 17% at 48% AMI (68 units) and 3% at 38% AMI (12 units), and the associated subsidy would be $12,864,000 [sic, actually $12,800,000] in HDC/HPD 2nd mortgage subsidy ($65,000 x 40 at 120% AMI, $85 x 120 units at or below 80% AMI). The overall schedule for all the subsidies that Atlantic Yards is proposed to be receiving needs to be updated though the $2 to $3 billion overall estimate is still basically correct. In particular, some subsidy costs respecting the arena need to be revised downward because tax exempt bonds have been issued in a lower amount than we used in our last set of calculations, while other arena subsidy amounts need to be revised upwards. The city has slipped more money to the developer, ESDC is advancing monies ahead of schedule, the MTA is getting a less desirable rail yard and it is a rail yard that may cost the MTA more in the long run because it won’t be flexible enough to meet the MTA’s real future needs, an additional $400 million in tax-exempt bonds was secretly authorized which may be used to bail out or to give the developer some extra gifts in the future. The MTA has also essentially given away for free to Ratner the right to name its subway stops in the area of the project. Let us then tally up just some housing subsidies including this new $144 million figure. $18 million: Next we still include an estimated $18 million for Low Income Housing Tax Credit credits, based on conservative estimated basis of $320,000 per low income unit and LIHTC of $20,000 each for 900 units. $39.37 million: Mortgage Recording Tax Exemption- Mortgage recording tax is 2.8% in NYC- At least the residential rental portion will be exempt from the tax. $150 million: “Atlantic Yards Carve-Out”—the provision that gave Forest City Ratner a special bonus in the revision of the 421-a tax law. That then totals $638.67 million. It does not yet include the millions that might need to be included for sales tax exemption on the residential units. It does not include the millions the MTA has given Ratner by selling its rail yards to Ratner for substantially less than their value. It does not include the millions the state and the city are giving Ratner for infrastructure costs. Very importantly it does not include the almost inconceivably huge giveaways to Ratner by virtue of a.) allowing Ratner to acquire much of the land for the project by paying much less than its value through the abuse of eminent domain and then, b.) making Ratner the special beneficiary of a tremendous upzoning at the expense of his neighbors. Is It Possible the Housing Subsidies Would Be Less? 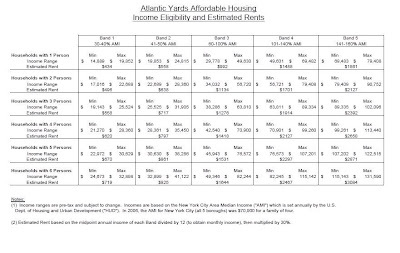 It offers several more scenarios regarding affordable housing in the Atlantic Yards project, promising affordable units with no low-income units far less affordability to the constituents of ACORN, the advocacy organization that supplied the most foot soldiers at public hearings in favor of the project. It opens up the possibility of subsidized buildings that are "100% affordable," with the majority of units aimed at households earning 165% of Area Median Income, or AMI. Scenarios 1, 5 & 6 assume that HDC will provide recycled private activity tax exempt bonds. 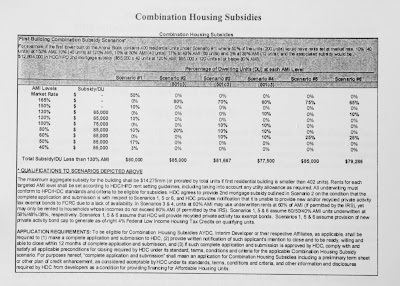 Scenarios 1, 5 & 6 assume that HDC will provide new private activity bond cap to generate as-of-right 4% Federal Low Income Housing Tax Credits on qualifying units. The transaction has been set up to enable Forest City Ratner to blackmail the public to send those subsidies to Atlantic Yards at the expense of worthier projects. This is reflective of the way that the Atlantic Yards transaction has always been structured to give the developer an upper hand and the tactics are similar to the kind of negotiating Ratner has engaged in before with respect to its Beekman Tower project. The second time Ratner made threats respecting a halt construction of the Beekman Tower it was the spring of 2009 and Ratner was threatening to build the building to half its originally planned height. Publicly the halt was to negotiate a better deal from the construction companies putting up the building. Because of a change in the economic climate Ratner was able rewrite the deal more to its benefit. Though it was never acknowledged, it is also possible that Ratner was having problems getting the credit in the credit markets it needed to be able to issue the final tranche of bonds to complete the project. you will note that while Ratner is not excused from building housing by a failure to get housing subsidies, the failure to get subsidies does entitle Ratner to delay in providing the housing. G) Notwithstanding AYDC's and Interim Developer's obligations to Substantially Complete (or cause to be Substantially Completed) the Phase I Improvements by the Outside Phase I Substantial Completion Date, so long as the Affordable Housing Application Requirements have been satisfied in each case, any Affordable Housing Subsidy Unavailability with respect to a proposed residential building shall result in a one-year extension of the Outside Phase I Substantial Completion Date solely with respect to the gross square feet proposed for Affordable Housing Units in such building in the application for financing such Affordable Housing Units, up to an aggregate of eight (8) one-year extensions of such Outside Phase I Substantial Completion Date; provided, however the aggregate gross square feet eligible for such extension for Affordable Subsidy Unavailability shall in no event exceed 450,000 gross square feet in any year. While Forest City Ratner is theoretically entitled to a total of eight years delay in the delivery of housing with respect to the first phase of the project, this is only the delay that Ratner is entitled to without paying for the delay. As observed by Norman Oder in the above Atlantic Yards Report article, Ratner has not only been given a very long time* to complete the mega-project without any penalty, twenty-five years in all, in addition the amounts that Ratner then has to pay for failure to complete within this specified are negligible. The damages Forest City Ratner faces in most cases--less than $10 million for an arena that's up to three years late, $5 million for each of three buildings if they're late--don't represent a lot of money, especially given that the developer just got a cash flow boost of $31 million to buy land. That’s $5 million for a single building, for example the third tower on the arena block that would paid 18 years from now (the 10 years in the schedule above plus the 8 year housing subsidy extension), a “penalty” that will procure for Ratner an unspecified period of additional years. At most it would come to $80 million for all sixteen towers. Obviously, the present value of the amounts paid will be lower when paid so far in the future. We invite any of our readers to identify any time they know of when a smaller percentage has been charged for such a long-term extension of an option to develop land. Lastly, since Forest City Ratner could still threaten not to build the housing unless the “penalty”/”option renewal fee” was waived (or subsidy increased to pay for it) those amounts may never be paid at all. It is sometimes bemoaned by those who actually want sports arenas built in their cities (we think they are disastrous economic boondoggles) that the owners of sports teams make localities bid against each other for the “privilege” of having such facilities located in their cities. Conversely, normally when housing projects are proposed, their developers have to show that they would be more beneficial than alternative deals by other developers in order to claim subsidy, in essence a form of bid process. That’s the way it should be. (If ownership of Atlantic Yards were broken up it would be still be possible.) Here, however, ESDC has structured a deal where that process will be reversed. Forest City Ratner wants to lay claim to more than a half billion in housing subsidy that could (and actually should) be going to other developers. But Forest City Ratner won’t have to deliver a better project to get that subsidy. They can actually deliver a far worse, much more expensive one. Forest City Ratner won’t have to think in terms of “bidding” to get their project funded with subsidy. Because they have been given a multi-decade mega-monopoly they can blackmail the public for those subsidies. And partly because so much density has been piled on top of this site that will come with a mega-tab for the public to pay. We miss you, no posts in over 4 weeks! According to Rafael Cestero, he said that we should have a set of programs that we use across the city. That fall within certain subsidy parameters that make sense for taxpayers and make sense for the city.